Java, the Complete Reference, 8th Edition is a book written by Herbert Schildt. This book is a guide Java Programming with sufficient depth discussion. 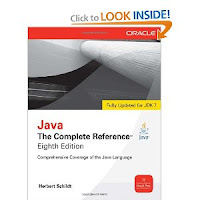 Java, the Complete Reference, 8th Edition has been updated according to changes in Java SE 7. The book is very well be a reference for beginners and experienced programmers in Java programming. This comprehensive volume covers the entire Java language, including its syntax, keywords, and fundamental programming principles. You'll also find information on key elements of the Java API library. JavaBeans, servlets, applets, and Swing are examined and real-world examples demonstrate Java in action. In addition, new Java SE 7 features such as try-with-resources, strings in switch, type inference with the diamond operator, NIO.2, and the Fork/Join Framework are discussed in detail. This book consists of four parts plus appendix and index. Part I consists of fourteen chapters. Chapter 1: The Introduction and Evolution of Java; Chapter 2: An Overview of Java; Chapter 3: Data Types, Variables and Arrays; Chapter 4: Operators; Chapter 5: Control Statements: Chapter 6: Introducing Classes; Chapter 7: A closer look at methods and classes; Chapter 8: Inheritance; Chapter 9: Packages and Interfaces; Chapter 10: Exception Handling; Chapter 11: Multithreaded Programming; Chapter 12: enumerations, autoboxing, and Annotations; Chapter 13: I / O, Applets and Other topics; Chapter 14: Generics. Part II also consists of fourteen chapters, Chapter 15: String Handling; Chapter 16: Exploring java.lang; Chapter 17: java.util Part 1: The collections framework; Chapter 18: java.util Part 2: More Utility Classes; Chapter 19: Input / Output: Exploring java.io; Chapter 20: Exploring NIO; Chapter 21: Networking; Chapter 22: The Applet Class; Chapter 23: Event Handling; Chapter 24: Introducing the AWT: Working with Windows, Graphics and Text; Chapter 25 : Using AWT Controls: Layout Managers and Menus; Chapter 26: Images; Chapter 27: The Concurrent Utilities; Chapter 28: Regular Expressions and Other Packages. Part III consists of four chapters titled "Software Development Using Java", Chapter 29: Java Beans; Chapter 30: Introducing Swing; Chapter 31: Exploring Swing; Chapter 32: Servlets.